A Galaxy Called Dallas: Play Like A Pirate This Saturday! Play Like A Pirate This Saturday! Join us Saturday evening at 6pm for an evening of pirate talk and back-stabbing fun! We'll be playing the Guest Artist Edition of Steve Jackson Games' Munchkin Booty. With Talk Like a Pirate Day this past Tuesday, we decided to continue the pirate fun with this pirate-themed game. 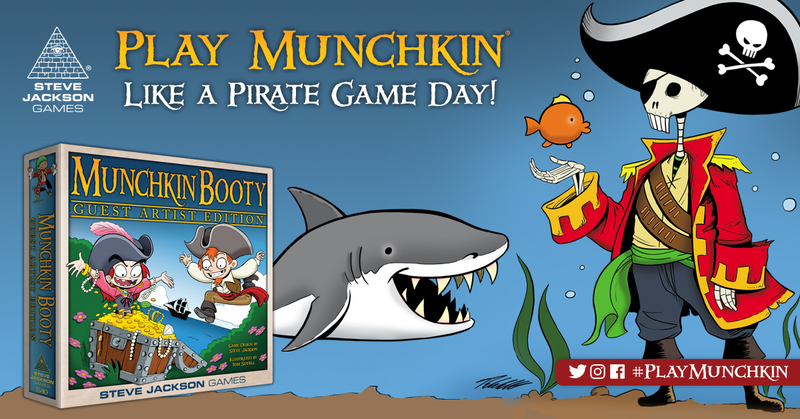 Come aboard Munchkin Booty Guest Artist Edition! Plunder your way across the Seven Seas! Munchkin Booty brings the greatest gold-grabbers in history – pirates! – to the world of Munchkin. Will you become a Dutch-accented Merchant wearing a Captain's Coat? Or perhaps a French-accented Pirate powered by Grog? Commandeer a Galleon or a Longship, and equip it with a Crow's Nest or a Figurehead. Grab a Cutlass or a Cutlad. Beat up Redbeard, Blackbeard, and Nobeard. Fight off Viking Kittens and the Lobster Mobster. And make your buddies walk the plant! This special Guest Artist Edition of Munchkin Booty is illustrated by Tom Siddell, best known for his webcomic Gunnerkrigg Court. All players will receive some cool swag in the form of playable cards and book marks and someone might just take the game home with them!